Classic and beautiful, this lush flower arrangement in green and white is ideal for any occasion. 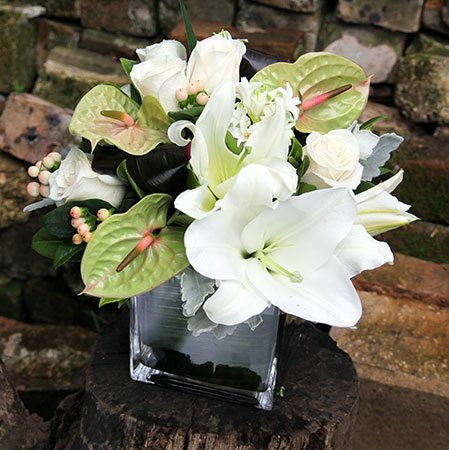 Designed by our florists in a quality, square glass vase, it features popular flowers including perfumed white oriental lilies and waxy green anthuriums, alongside elegant roses, seasonal white blooms and berries. Place your order via our online florist shop or phone our helpful consultants toll free on 1800 66 66 46. 2015-11-13 Service rating : I always find the staff really helpful and the online system easy to use. Product : I saw the arrangement. I thought it was a bit small for the price and it contained a lot of November Lillies which are quite cheap.